The Edit menu allows you to edit various aspects of the program. Please note the shortcut keystroke for common operations are also defined on the menu, you can use the keyboard shortcut to invoke the associated function directly from the keyboard. You can also see shortcut icons for some menu items on the menu as a guide that there is a shortcut toolbar icon for the option. This allows you to edit the current position or set up a new position. It opens the Set up position dialog. Copying the current Position to the clipboard allows you to paste the position into another tab or into another chess program which supports pasting positions. The Position is copied in FEN format. Copying the Game to the clipboard allows you to paste the game into another database tab or into another chess program which supports pasting a game. The game is copied in PGN format. Copying Games... is a powerful and easy way to copy a selection of games to another database tab in the GUI.You do need at least one other database open to use the Copy Games... function. You can read more about this function in the Copy games section. This submenu allows you to paste a Position or a Game from the clipboard into the current tab. This enables you to copy positions or games from other programs or between tabs inside HIARCS Chess Explorer. The Merge with current game menu option enables you to merge a game with the current game in the Game Notation pane. This is a very powerful analysis feature, you can read more about this unique analysis feature in the Merge game section. This option allows you to undo the last operation you performed in this tab on the current game. This is very useful to reverse mistakes made in Game Notation. There is no limit to the number of undo operations you can perform since the game was loaded. This option allows you to redo the last operation which was undone by the Undo command above. There is no limit on the number of Redo commands performed. If the move is at the end of the current variation, the move is added to the game notation. If the move is new and different to that played in the game notation, a new variation will be started in the game notation with the move inserted. If the move is the next move in the game notation no new move is inserted but the position changes to that after the move was played. Please note if you want to insert the whole line currently being analysed by the current engine simply click on the score/depth text value and the whole line will be added as a variation with the evaluation and depth. In this case the engine will continue to analyse the current position. Null move - this menu item makes a null move in the current position. A null move is basically making no move therefore giving up the right to move, the opposite side will then be next to play. A null move is illegal in chess play but is very useful in analysis, for example you may play a null move in a variation to illustrate what would happen if the side to play does nothing, thereby showing possible threats of the opponent. Please note a null move can also be played on the chess board simply by moving the king of the side to play onto the opponents king. Null move now has a keyboard short cut of Cmd+0. Start comment.... - this allows you to insert a text comment before the first move of the game. It will bring up an Edit comment dialog. Comment... - this allows you to insert a text comment at the current move in the game notation. It will bring up an Edit comment dialog. You can also add diagram in the Edit comment dialog. Please note there are many other context specific items like move, evaluation and other symbols which can be inserted by right clicking your mouse on a particular move in the Game notation. Current variation - this option allows you to remove the current variation shown in the game notation. It has no effect on the main line of the game, it only affects variations. All comments - this option will remove all the comments from the game notation. All variations - this option will remove all variations from the game notation. All symbols - this option will remove all move and evaluation symbols from the game notation. Everything except main line - this option will remove all comments, variations and symbols from the game leaving just the main line of the game. This menu item allows you to promote the current variation shown in the game notation up one level closer to the mainline. If the variation was only one level down from the main line then the variation would become the new main line with the previous mainline becoming a sub-variation. 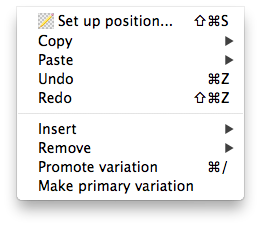 This menu item allows you to make a variation the top (first, primary) variation where there is more than one variation available. This enables you to order the variations to your preference. Please see the move context section for how this works.